Jeyanthy Siva is an international trainer, mediator, and coach. Having worked as a trainer since 2000 (in USA, Europe, and Asia), she has trained change makers, leaders and teams in interpersonal communication, conflict mediation and group decision-making process. When requested, she provides coaching and sounding board service for decision makers, working with clients in different sectors ranging from NGOs, government agencies, hospitals, schools and the private sector. Her educational background is from University of California, Berkeley and Rutgers University, New Jersey (USA). Currently, she is based in The Netherlands and travels to other parts of the world. 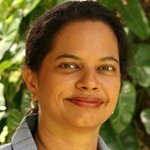 Her varied training background ranges from community and youth groups and peace building organizations (Sri Lanka, East Timor), to academic institutions and hospitals (Sri Lanka, Italy), to police departments (UK), to social change activists (USA, Thailand) and to the general public (Finland, USA). She also serves as board of director of the Sandhi Institute, a non-profit organization that provides training and facilitation in nonviolent communication, conflict resolution, and skills for healing and reconciliation. She studied for many years with Marshall Rosenberg, developer of the Nonviolent Communication (NVC) model and founder of the Center for Nonviolent Communication. She first studied with and then collaborated with trainers from BayNVC in Berkeley, CA (USA) in the late 1990’s. She has been mentored by and worked with Joanna Macy (author, systems theorist and Buddhist scholar) for many years.